This cupboard consists of a frieze with carved lunette decoration and carved drop finials, on one corner the initials 'AH' , these probably being the initials of a previous owner. This leads down to the top section consisting of the superbly carved central panel of 'the tree of life' design with further carved floral and foliate decoration both above and to the side. The central panel is flanked by a cupboard to either side, the doors with superb carved floral decoration. This leads down to the lower section consisting of lunette carved decoration to the top with two cupboards below, each door having three recessed panels which open to reveal a shelf inside. The sides are panelled and the cupboard stands on original feet. This superb oak cupboard is in excellent, untouched original condition for age, is of stable construction and can go straight into a home. 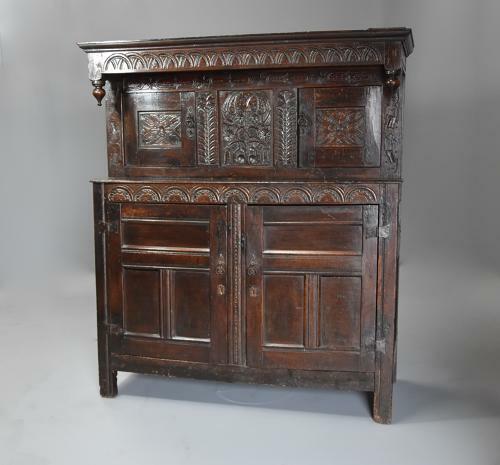 In the 17th century the press cupboard (or court cupboard) was considered one of the most prestigious pieces of furniture in an ordinary house, probably only second to the tester bed. They would normally be given pride of place in the hall or parlour and were also often used as room dividers. The presence of carved initials and dates would often be found on important pieces of furniture of this period, the initials normally referring to the owner of the piece rather than the maker.